A little nervous energy was in the air a few days before entering Slovenia. After months of the foreignness of foreign travel being relatively low in western and then central Europe, life was going to get more challenging on the Balkan Peninsula. Slowly the things that would be different came to mind. The Euro currency would vanish and at every border, we'd be dumping the old currency for new and juggling a new exchange rate in our heads. And our passports would be coming out as we exited one country and entered the next, unlike in the EU. Gone would be the usefulness of our varying abilities with German, French, Spanish and Italian and we would become nearly mute with the baffling Slavic languages. And the agility that had served us well in bouncing between the idiosyncrasies of more western cultures would no longer come to our aid. First was the focus on spending down our Euro's so as not to carry excess cash or lose value in exchanging our money as the new currencies would all be acquired at ATM's for the best rates. The night before we entered Slovenia we were pleased to be down to 10 Euro's in folding money which we'd keep and 22 cents in coins which we'd leave behind. But as Bill read about money woes in Serbia, we decided to load up on Euros on our way out of Austria as they might be more useful than the local currency. Two days before crossing the border from Austria I had troubled a bank clerk in Villach for the exchange rates in Slovenia, Croatia, and Serbia. We always get that information after arriving in a country, which is really too late. Knowing the exchange rate is immediately helpful in deciding just how much cash to get from an ATM. The shocking part of the trip to the bank was being told that they could not give me an exchange rate for Serbia because they use "old money." We laughed knowing it likely wasn't the age of the money but probably the high inflation due to economic instability that was making the currency tricky to call. Our last night in Austria was spent about 15 miles from the border, near where we spotted a memorial to a town that had vanished. Some sort of factory or mill was there for almost 100 years but in 1989 it was shut down and all the people had to relocate. Bill struggled with the translation from German but the presence of Slovenian text and the "1989" had us wondering if the collapse the USSR played a part in it. We were still in Austria and already the influences of the eastern block countries were showing. In 2003 when we entered Hungary from Austria, Austria looked unchanged right up to the border but Austrian life here looked less prosperous. Even the food selection in the store that night signaled the changes that we'd be immersed in the next day. 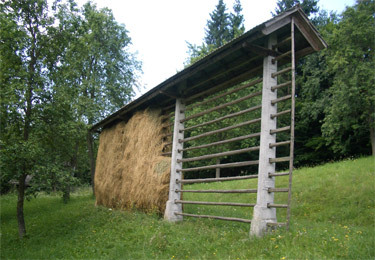 A 20th century concrete rack for the traditional method of hay drying. Just as we had remembered it on our prior brief visits into Slovenia, it looked like a going concern. 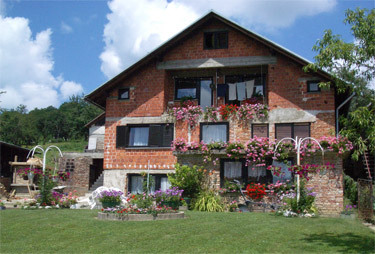 The homes across the border were well kept and made cheery with window boxes of flowers. I enviously watched to see how many of the cars had air conditioning on this 90° day that was humid from brewing thunderstorms and there were many. The first market I shopped in was a "Spar", which was the same company I'd shopped in Austria. The floor layout was the same, making it easy to find my way and many of the same brands were on the shelves. And surprisingly, the "default" language on some products switched from German to English. With few exceptions, the only challenge was estimating the prices in the new currency. It was a very different experience from our first shopping trip in an eastern block country, the Czech Republic in 2001, when little in the grocery store was familiar. And even the difficult Slavic language wasn't so alarming this time as our prior experiences with Czech and Polish softened the blow. Not that we can utter more than a "hello" but we quickly started recognizing commonly used words. The similarities in prosperity between Austria and Slovenia that greeted us when entering Slovenia reflected its long history. Compared to those of their other Yugoslav neighbors, Slovenian history chapters have often had happier endings. Their proximity to Vienna during their centuries as subjects of the Austro-Hungarian Empire helped them prosper under the reign. And when Napoleon ruled the roost for a few years, Slovenia advanced itself with the influx of new culture and thought. Unlike many other peoples on the Balkan Peninsula, the Slovenians never lived under the disruptions of Ottoman rule. But unhappily, they were on the losing side of WWI and the final divvying-up of Europe in the aftermath of the war left 1/3 of Slovene speakers (and their land) outside of Slovenia and instead in the hands of Italy and Austria. Modern machinery hay rolls encroaching on a hay drying rack. The resulting much smaller Slovenia allied with the Croats and Serbs to survive. But even in the former Yugoslavia, Slovenia continued to outshine its fellow republics with greater growth and prosperity. Their long history of weathering the storms better than their Slavic neighbors is still true. And being 90% Slovene spared them the ethnic crises that still fuels violence farther south in the Peninsula. It alone of the former Yugoslavic Republics has already joined the EU in 2004's round of new-member countries. But Slovenia has done so well economically that its membership will actually be an burden to them as they will be a net contributor to the Union helping to subsidize poorer countries, like Poland. 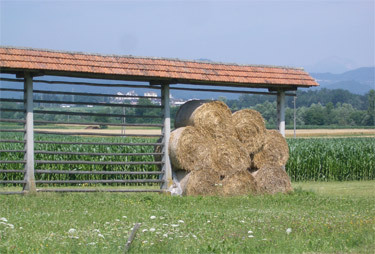 Hay drying racks in Slovenia seemed to be a symbol of its rapid change and prosperity. There were many old racks still standing on the farms we rode by but very few were used for drying hay. Most now formed the high wall for a sloping storage shed or were a leaning place to consolidate odds and ends. And a few were used to neatly stack hay formed into rolls by the modern machinery. Like the stone and wooden granaries in Spain, this icon of their agricultural heritage was also being used as a symbol for marketing, such as on restaurant signs. Bill wiggled our route so that we'd visit Ljubljana (lub-lee-ya-na), at my request. I knew nothing about the capital city and wanted to take a look. It is a big sprawling city with a charmingly revived old town. Grand buildings from both the Hapsburg and Art Deco eras grace the streets along a well-featured river. The lively atmosphere of the outdoor cafes blended with the bustling of a huge outdoor produce market not far away. Despite the searing heat and wilting humidity, it was a pleasant city to stroll in. We are slowly learning that our urban sightseeing days on foot are a good opportunity for identifying new trees as many cities haul in interesting specimen trees for their streets. Ljubljana was no exception and as we walked from the old town up to their hilltop castle we added a few first sightings to our list of identified trees including a red-leafed filbert and a fox-glove tree that unfortunately wasn't in bloom. Our tree identifying project began a year ago in Britain and has added a fun wrinkle to our travels. 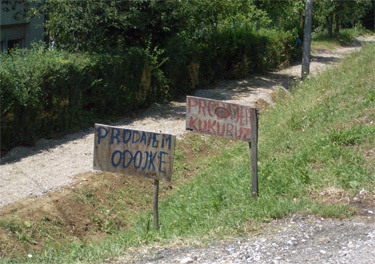 English was wide spread in Slovenia, especially in the capital, making everything easier. While in a bookstore, I was surprised to see laminated trilingual vocabulary sheets for teaching small children words like "teddy bear". The cute drawings and careful color coding made the easy to use series very appealing and there were a number of language combinations from which parents could choose. The same bookstore had case after case of English teaching materials--the most we've seen anywhere. This, our fifth year of travel, keeps renewing old lessons, especially "Ask and ask again" and "Don't take 'No' for an answer". Our latest challenges have been with the disintegrating antireflective coating on my new prescription lenses and trying to go to a movie. The antireflective coating on my new lenses started deteriorating a few months after I got them and left me with a headache-producing smudgy mess to look through. It's an unusual failure in the product and an email from the optical shop back home was reassuring that the coating could easily be stripped off in a half hour and reapplied or not. But that is in the US. In a succession of optical shops in a growing number of countries in Europe I was told that the only remedy was to replace the lenses. I had the prescription with me, but replacing my compact-sized, progressive lenses would be out of sight price-wise abroad and take several weeks. At the same time, we were reminded of similar aggravations on a smaller scale. Bill had his heart set on seeing a movie while in Ljubljana after learning that English titles were in a theatre near our hotel. Knowing the importance of "Ask and ask again," we went to the theatre hours early to confirm that it was indeed in English, to learn the length of the movie, and to write down the show times. When we returned to actually see the flick we were told that the movie was at a sister theatre miles and miles away. Of course, the first English speaking clerk hadn't mentioned that when we were asking our questions. We had shown her their published schedule and discussed all of the details with her but had failed to confirm that the published timetable at her window was for movies at her location. Bill was very disappointed but it was a good reminder of how thorough and complete one must be for information that really matters, no matter how stupid they think you are for asking so many questions. An upscale Iron Age burial urn found in Croatia. Croatia was second only to Slovenia in prosperity in the former Yugoslavia and like Slovenia, was anxious to be freed from its less prosperous and troublesome neighbors after Tito's death in 1980. But Croatia took the brunt of Serbian wrath for separating: Slovenia escaped with an almost bloodless 10 day war in 1991 with Serbia but Croatia continued a blood-bath with the Serbs into 1995 with each side doing its share of horrific ethnic cleansing. 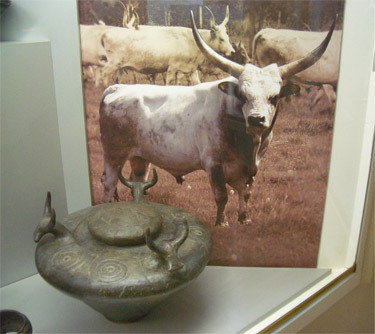 Croatia has long been the step-child next to Slovenia but when it comes to museums, we give Croatia higher marks than Slovenia as the Archeology Museum in Zagreb had some choice finds beautifully displayed. On our second day out of the capital city of Zagreb I scrutinized our surroundings, struggling to put words to what is so different about Croatia. It is a curious crossroads country. Coastal Croatia especially has long considered itself European, not Balkan, and the Italian control of the northern portions from 1918 to 1943 only reinforced that mindset. And Tito's modified brand of communism permitted more free travel and the luckiest coastal Croatians made regular clothes buying trips to Italy. Though it is indisputably on the Balkan Peninsula, the decades of looking across the Adriatic to Italy and identifying themselves with their western friends rather than their bordering Balkan neighbors shows. Their sense of style certainly reflects this history of having kept up with European fashion tastes and trends. I often wonder if this greater historical contact with Europe that fuels their urgency for Central European looking homes. Having a 2 storied house with a yard is definitely "in" and many people built them though they lack the resources to ever finish them. The terra cota red blocked homes with sloppy mortar joints still exposed are part of the landscape in Croatia. A white stucco finish should be applied to finish the job, but it appears that many homes will never 'arrive.' The aging look of concrete porches and tile roofs suggests that these homes are occupied in their not-quite-finished state for decades, a decidedly Balkan way of dealing with scarce or intermittent resources.. Unfinished Croatian house with its completed landscaping. We rode by many of these 'in progress homes' and saw white draped tables and a circle of dining room chairs set-up in open garages as well as small social gatherings in garages. Some garages lacked any door at all and a few had fabric draping for the door. Often only the ground floor was closed in and the windowless openings on the upper floor revealed laundry hanging to dry in the unoccupied space. Some of these partially completed homes had landscaping and flower boxes, defying the unfinished exterior. And yet despite this very European orientation, the less coastal regions in Croatia reminded us of being in the Czech Republic, especially when it came to decor. It is only in these more eastern, former communist block countries that we see one pattern of what is to us rather bizarre decorating. Some of it makes me wonder if it's an attempt to emulate Czarist era grandeur with tiny hotel rooms being stuffed with cheap furnishings. In our Zagreb hotel, deep tones bordering on black were used on the bedspreads and in the laminated wall paneling. The paneling was trimmed with brassy strips of metal at several different heights up the wall. Gold fringe on the fabric lampshades and on the bedspread added to the glittery look. The candle-chandelier-styled fussy light fixture continued the ornate, gilded theme. All of this was in a room so small we could barely walk upright around the furnishings. Less formal looking rooms at B&B's were also often crammed with furniture that leaned towards gold or brass accents with mirrored glass on the headboards. Animal skins atop low stools often showed up in these rooms and the light fixtures look like the $10 products at the do-it-yourself big-box stores in the US. Our over-priced $35 room (with shared bath facilities) in a village was a riot of vibrant colors: the strong blue that looks great in the sky but overpowers interior spaces coated the walls; the indoor-outdoor carpet was a deeper shade of red than the bright vinyl chairs in the corner; and the beds were busy with bright orange pillow cases, pink sheets and brown leopard spotted fuzzy synthetic blankets. 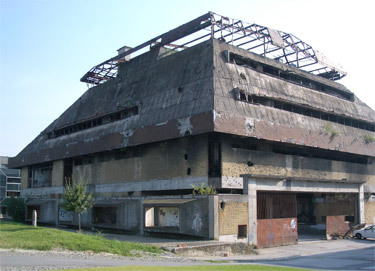 Then there are what we have dubbed the "comrade hotels" from our first experiences in the eastern block countries. Those are the communist-eras hotels that are often very institutional feeling though not necessarily inexpensive where too many features aren't quite right. Croatia's aren't as extreme, but the $80 hotel where the shower curtain was too short to contain the water, the cabinet for a refrigerator lacked a frig, the info sheet that indicated CNN used to be received on the TV, and the large closet only had 4 hangers reminded us of the more authoritarian times. The struggle these patched-together looking lodging decors communicate is echoed in the industry around many Croatian homes. Yards aren't just for leisure and many are serious food-producing affairs. Chickens, geese, sheep, and goats are common front yard occupants in town and you don't have to be out on a farm in Croatia to see a dead pig hanging by its heels. Corn cribs that are abandoned in many countries are 2/3's full of ears here. Fruit bearing trees and grape arbors double as shade producers for outdoor meals and vegetable gardens are far more prevalent than flower gardens. And every few minutes we'd pass by at least one discretely displayed, hand painted sign offering home-grown or brewed products for sale. But shortly after leaving the small city of Novska, the subject of our contemplation took a radical turn. No longer were we admiring the productive homesteads struggling to look like charming mountain chalets, now we were looking at home after home riddled with bullet holes. For miles the buildings had been one house deep along the road which we thought curious but now it looked lethal. It was too easy to imagine a couple of military vehicles cruising down this one-and-only-road effortlessly spraying every single home with bullets. The solid brick of the older homes were shallowly pitted but the partially hollow blocks of the newer constructions were more prone to shattering. All of the windows must have been shot out in all of the homes as in the many abandoned buildings we could see the damage done to the interior walls from the blasting. 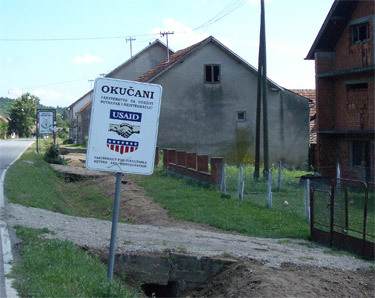 US Aid sign in the foreground; EU in the background. In horror, we began estimating how many homes had been abandoned since the fighting more than 10 years ago. For the first miles, it seemed to range from 10-25% of the homes being abandoned but later one village was all but a ghost town. At first, we didn't see any roofless homes, but as we rode farther east towards Nova Gradiska, roofless hulks began appearing. The ruins of churches, burnt-out homes and blown-out walls spoke of greater violence. Closer to Novska the bullet patterns looked like the emphasis had been on terrorizing rather than killing and destroying, but annihilation seemed to be the intent closer to Nova Gradiska. The WWII memorials were supplemented by ones covering the conflicts from 1991 to 1995 in monuments ranging from almost private ones commemorating a couple of people to town square edifices with long lists of names. Signage added curious details to the story we struggled to understand from the sights before us. Both the US and EU had signs declaring their respective "return and reintegration" programs. And then there was the land mine sign out in front of a mostly destroyed home. We pondered why there were land mines in a single home and wondered if it had been booby-trapped. The chilling sights of the recent violence helped explain why lodging was in short supply and we were being forced to ride 50 mile days in the heat whether we wanted to or not. The still visible signs of violence were hardly beckoning to tourists and there seemed to be few sources of work in the area beyond the small farms. We later learned that this small area of Croatia was only officially returned to Croatia from Serbia in 1999. Closer to Novska in the west the abandoned homes were overgrown as if people were trying to forget them. Then after the US and EU signs began appearing, more of the homes had been tidied up and swept out, as if to say "we are sorry". 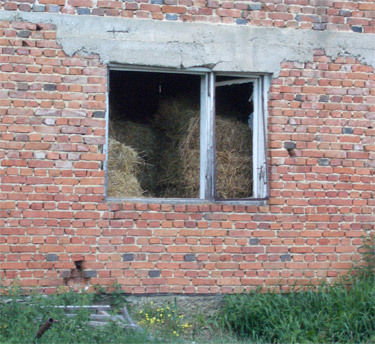 But a few of the abandoned homes were filled with baled hay suggesting either "We know they aren't coming back." or "We don't want them back." "Borrowing" a dislocated family's home for a barn. The border with Bosnia Herzegovina was only 3 miles away from the road we traversed. We wondered if they or the Serbs entered the area or did the Croats turn on their Bosnian or Serb neighbors and force their departure? Later we read that the this violent scene had been a Croatian-Serbian conflict over secession. And Bill remembered that Serbians managed to fight all of their battles off of Serbian territory so we weren't likely see these scenes once in Serbia. Our minds were traumatized by the sight of all the violence. The thoughts of all the horrors that occurred here were only interrupted by the recklessness of the Croatian drivers whose antics kept bringing us back to the present. Twice in an hour as we pedaled our way east on a quiet Sunday afternoon I found myself shrieking in fear as young men behind the wheel of speeding cars came charging towards us in our lane of traffic. One was inexplicably driving in the wrong lane as he rounded a blind curve and was too close to us for my comfort at road's edge. The second oncoming driver elected to pass a string of cars and began his acceleration on this shouderless road as he passed us, which left me shaking and wondering why he couldn't delaying his maneuver a couple of seconds. That level of fear response is normally only triggered in me once a year or less but here we frequently felt at risk. We pondered if the bad behavior was coincidence or not. Perhaps this reckless driving was a reflection of the recent violence and experiencing too much disregard for life in the regional wars. But as the near-misses accumulated we were less kind and wondered if a nasty underlying attitude had instead contributed to the ethnic violence. The next day wasn't as terrifying but still left us with a low regard for Croatian drivers. The burden for safety on the road is carried by a few:, as when a car had to suddenly halt to avoid being hit by a school bus speeding past us in an obviously dangerous junction. Their driving conditions are poor, with narrow, shouderless roads lacking passing lanes or pull outs that are used by everything from bikes to farm vehicles to big trucks pulling trailers. But their "out of my way" horn honking is a poor substitute for good judgment on the road. The chilling view: our first sighting of a land mine sign and of a blasted home. We saw our first-ever "Warning: Land Mines" sign just before we began seeing the homes sprayed with bullets. We were aghast. A bombed out home stood as calmly as any other home on the block with a single sign in front of it like a "For Sale" sign. Just a single sign on the overgrown property warned of the risk of sudden death. We were stunned. "How could that be? Why is it tolerated? Why one house?" What a bizarre existence to calmly integrate land mine warnings into the back drop of your day, of your life. And then they dropped away until we got closer to the eastern most city in Croatia, Vukovar. Seeing the multitude of land mine signs west of Vukovar was horrifying. They were of no practical significance to us, but they sparked both outrage and fear in us. "How awful, what a waste, how terrible...." kept coming out of our mouths. And the fact that known mines were still in place on an abandoned lot with an occupied house on each side of it--outrageous. We want to know why, what was the hold up, why wasn't the obvious being done, why weren't they removed. We thought about the neighborhood children, about the mentally incompetent people that wander around, the dogs and the diminished sense of well being for the community in having the mines remain for a decade after the war. Needless to say, we certainly modified our "peeing in the bushes" behavior. Public toilets are non-existent in many countries and so we are careful to empty our bladders before arriving in town, but not in eastern Croatia. In this region of land mines we peed in town, not in the country. We were peeing behind the bushes in school yards and behind barely concealing roadside concrete barriers--being discreet became less important than not being blown up. And we nervously joked about the double jeopardy of getting hit by a car driven by one of the idiot drivers and then being tossed onto a landmine. We carefully cataloged the 4 different land mine indicators that we saw so as to readily recognize them on the fly, which probably added to our suspicion about 1 pair of signs. They were a 5th style we hadn't seen, though they were convincingly faded blue signs with the single word "Mines" on them. But the "what's wrong with this picture" was the setting. They were placed on either side of a small dirt driveway into a neatly manicured spare lot orchard. The grass was cut and the trees were pruned. We presumed that this pair of landmine signs positioned like garden statuary were an attempt to discourage fruit poachers rather than warn of mines. Vukovar's former department store with a neatly mowed lawn. In Vukovar itself there we saw no land mine signs, but nonetheless I found myself tiptoeing around on the grass and bare ground. The freshly mowed grass was surely safe, but the nearby blown-up buildings echoed the message of the absent sign. The land mine consciousness when walking on grass stayed with me for weeks as I found myself hesitating any time I stepped off of pavement onto the earth. And it didn't take long until land mines signs were appearing in my dreams. The land mine signs weren't the only interesting reading on our numberless road that paralleled the rail line likely from Hapsburg times and the almost completed freeway from Zagreb, Croatia to Belgrade, Serbia. Looking up occasionally revealed a discrete sign indicating that the newly rebuilt electrical system was funded by the EU. Other signs indicated donations by the US and programs funded by the EU but implemented by Germany. The Croatian flags and youths in sports outfits patterned after the flag abounded as we progressed east. Yes, they have a right to be proud that the international community forced Serbia to return these lands to them in 1998, but it was over zealous nationalism that triggered the atrocities 14 years ago. It seemed that the emphasis should be on finding common ground with others, not drawing lines in the sand. My idle mind often does crude demographic surveys as we ride by looking at license plates on passing vehicles. Not only are most plates distinctive for the country of origin, but in many countries the several alphabetic characters allow for guessing the region. In eastern Croatia, I marveled at the lack of cars from either Serbia or Bosnia-Herzegovina as for days those countries were only a few miles away from this skinny sliver of Croatia. It made us wonder if lingering hostility was keeping people at home. This non-touristy area of Croatia that lacked any tourist info offices and offered little lodging did have a lot of foreigners cruising through on our road that paralleled the freeway. In the last 3 days of our 4 day trek east out of Zagreb, I saw plates from at least 15 countries. As usual, the Germans were out in large numbers. But it was odd that most of the German-licensed and a few of the Austria-licensed cars were parked out in front of Croatian homes and not in front of the few hotels or stores. It was like they were visitors instead of guests. I watched and watched and there was this steady sprinkling of cars from Germany around. We wondered if they were ex-patriot Croatian's home for a July holiday. Our hypothesis got some support from a German-speaking woman who stopped to chat as we were launching from a Vukovar grocery store. She inquired about our trip and shared that her dad was from Vukovar and that at the time of the war in the 1990's she moved to Germany and her sister moved to Australia. This was one of 2 summer vacations in Croatia for her this year to bring her children back to 'the old country.' Not surprisingly, she was only visiting, not returning to stay. 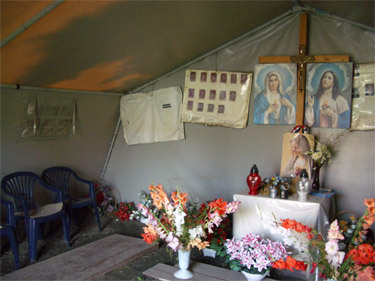 A refuge tent turned into a roadside memorial for the missing. This had been our third visit to Croatia and on the first 2 the only thing harsh was the winter weather and high prices. 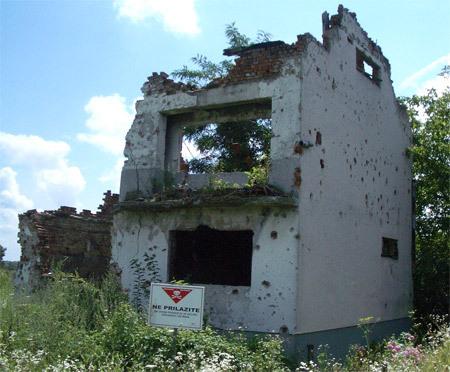 But this brief visit to war-scarred eastern Croatia had been deeply disturbing. Yes, we had looked at the few bullet holes in the walls of Dubrovnik and lamented the loss of their beautiful handmade roof tiles and we read the story in the Zagreb museum about the attacks on that city on our previous visits, but nothing compared with the land mine signs lining the roads in the east. Before leaving Austria and the EU we had been a bit apprehensive about biking in Serbia and the scars of war and massive cemetery in Croatia did nothing to make Serbia more welcoming. And the aging refugee tent with its swept dirt floor now serving as a memorial to the missing Croats near the Serbian border only further rattled our waning confidence. We once again wondering if Serbia was a suitable biking destination but would soon find out. We are on a 2 hour ferry ride from Istanbul to Bandirma, Turkey. In addition to enjoying this history-packed city on my short "Must See" list and visiting with friends from California on a group tour, we have been agonizing over our trip "down under." After countless hours on the internet which had us bumping up against excess baggage charges for half of our luggage and disappointing advise from Lonely Planet like "buy a used car to best see Australia", we've decided to postpone our dip south. We are coming home early to regroup, perhaps visiting Australia and New Zealand in 6 months to a year after we have had more time to do the planning. That region clearly doesn't lend itself to impulsive travel with bikes like Europe does. Yesterday morning we booked a flight home on December 6 before the fares go up for the holidays and will return to Europe on February 14. Map Man's nose is buried in the books trying to figure out where we are going next. We will visit a few more sights in coastal Turkey south of Izmir and then likely hop a ferry to Greece to get closer to our departure city of Frankfurt.